RosaParksBooks is a Legacy Library. Legacy libraries are the personal libraries of famous readers, entered by LibraryThing members from the Legacy Libraries group. » Rosa Parks's legacy profile. RosaParksBooks is also an author. 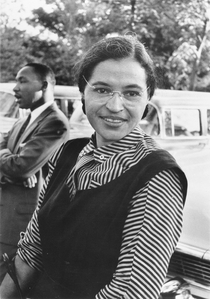 » See Rosa Parks's author page. A call to conscience the landmark speeches of Dr. Martin Luther King, Jr. by Martin Luther King, Jr.
About meRosa Parks (4 February 1913 - 24 October 2005), American civil rights activist. About my libraryThis library includes volumes from the Rosa Parks Papers, currently on loan to the Library of Congress. The books are cataloged in a separate series, Books Owned by Parks, 1866-2001. If you have information on additional books from Rosa Parks' library that should be included here, please contact JBD1.